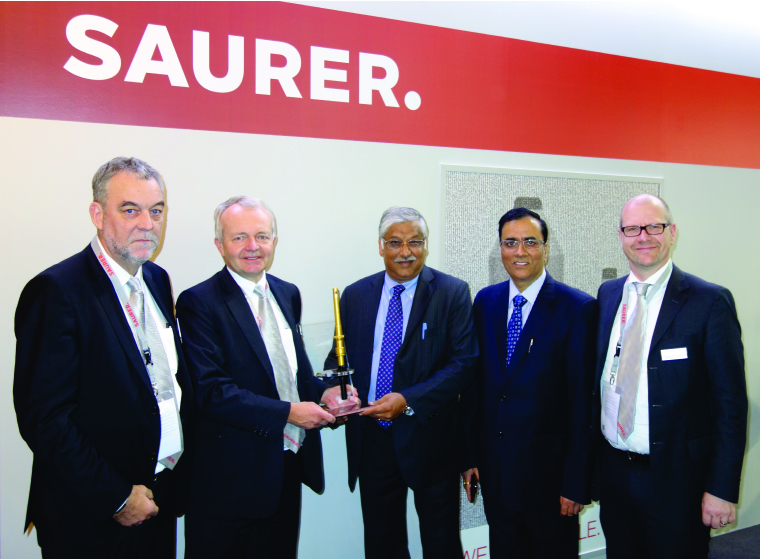 From left to right: Henri Wiggers – Regional Sales & Service Director of Schlafhorst Zinser, Dr. Martin Folini, CEO of Saurer and Saurer Schlafhorst, Anupam Agrawal, Director of the Spun Yarns Division of Indorama, Virender Kumar Bhalla, Manufacturing Head of Indorama, Ralph Knecht, General Manager of Ring Spinning. With spinning mills in Indonesia, Uzbekistan, Sri Lanka and Turkey, the Indonesian company Indorama Synthetics is one of the top ten manufacturers in the industry. Zinser has been supplying Indorama with ring spinning machines since the 1980s. The company has now commissioned its 100,000th Zinser spindle: a 2Impact FX compact spindle. This milestone was marked at a small ceremony at ITMA 2015 in Milan. Dr Martin Folini, CEO of Saurer and Saurer Schlafhorst and Henri Wiggers, regional sales & service director of Schlafhorst Zinser, presented the Golden Zinser Spindle to the director of the Spun Yarns Division of Indorama, Anupam Agrawal and Virender Kumar Bhalla, Manufacturing Head of Indorama. This year Zinser delivered over 40,000 2Impact FX compact spindles to Indorama. The 100,000th spindle was on the fifth machine delivered. Following the installation of all machines, Indorama now has around 140,000 Zinser spindles. The compact spinning machines process 100 % combed cotton to produce particularly high-quality compact yarn in counts ranging from Ne 20 to Ne 40. They are integrated into a fully automated linked system extending from the Zinser roving frame to the Autoconer package winder from Schlafhorst. For many years Indorama has been producing yarns of 100 % polyester on Zinser 351 ring spinning machines.